The preferences in terms of design are very subjective, that much is clear. I have to admit that the View 10 won’t wow you with its design, but it’s along the same lines as the Honor 8/Pro. It offers a classic metal body that is quite thin, has rounded corners and is slightly slippery. In my opinion, the Honor 9 has a better design. The View 10 doesn’t have glass on the backside and the two photo lenses stick out too much. The physical buttons on the right side are easy to reach and easily distinguishable from their different surfaces. The fingerprint sensor is located on the front panel and is easy to use, even if your smartphone is on the table in front of you. It’s a nice phone, yes, but nothing special. 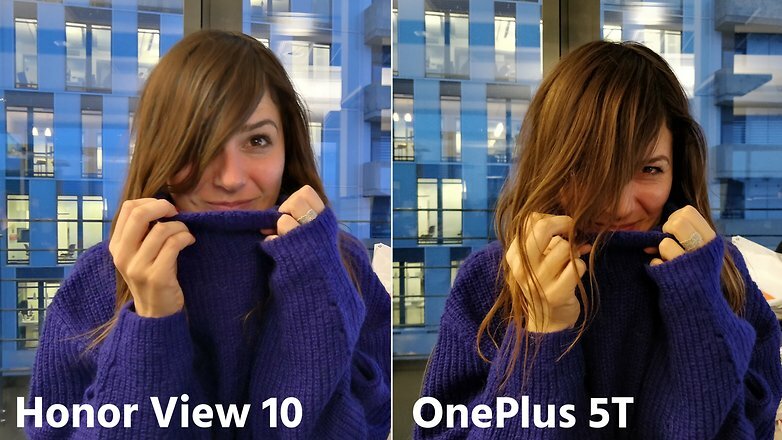 When I pick up the View 10 and the 5T at the same time, I prefer the design from OnePlus. The design of the OnePlus 5T is really well done. 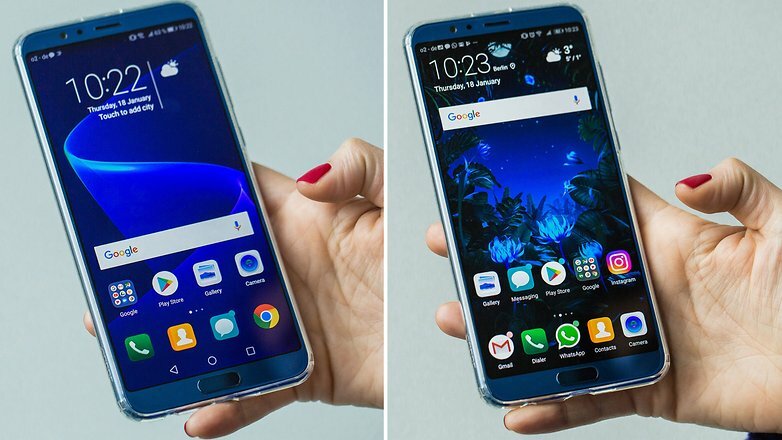 Due to the narrow display bezels, the smartphone is not too wide despite the large display. The back side is slightly bent, so that the 5T fits well in your hand. There is one small but important detail: on the long sides there is a clear edge that ensures an easy grip. The manufacturing is excellent, the camera is elegantly integrated into the back and the front side is protected against fingerprints with a coating. The white version looks somewhat better and is also less slippery than the black OnePlus 5T. Compared to the somewhat boring Honor View 10, in my opinion the OnePlus 5T has clear style advantages. Twin App: This is nothing new for Huawei/Honor, but it’s pleasant to find you can use two WhatsApp and Facebook accounts at the same time. This is convenient especially for those of you who keep two accounts, one for work and one for private life. Private area: Here you can set a different password and fingerprint for access to a private area. Ideal if you want to keep photos, apps or other information hidden from prying eyes. It’s easy to adjust, but does somewhat slow down the device. Face recognition: Unfortunately, it’s not yet possible to unlock View 10 with face recognition, but you can access the contents of messages that would otherwise remain hidden. Face recognition is really fast, but it’s a pity that this feature is only halfway implemented. But still, an update will likely change this soon. It just hasn’t arrived on our test device yet. Microsoft Translator: Here’s another insider’s tip that already exists on the Mate 10 Pro. Google Translator is undoubtedly the best known service, but Microsoft’s app uses the artificial intelligence of the Kirin 970 and responds immediately to commands. It is particularly useful in international work environments, such as here at AndroidPIT. 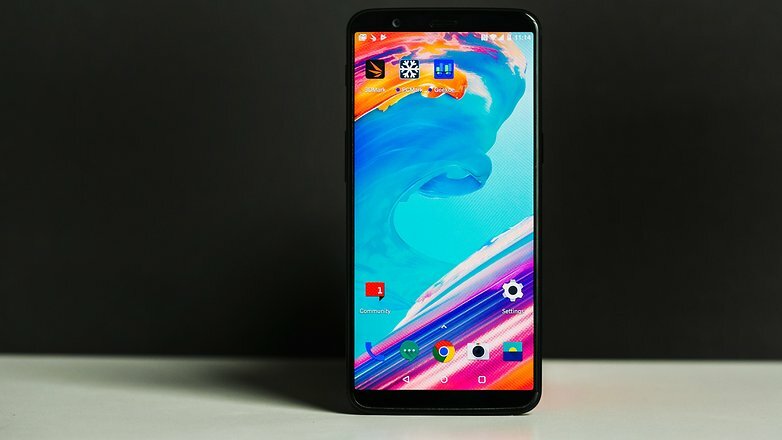 Face Unlock: The OnePlus 5T can be unlocked with face recognition. This may not be as technically sophisticated as with the iPhone X, but it works like a dream, even in low lighting conditions. Together with Tap to Wake, Face Unlock is unbeatable on the 5T, so Honor can’t compete with OnePlus here. Always-on Display: On the lock screen of the OnePlus 5T I can display the time and notifications. That’s super handy and if I set it accordingly, the always-on display wakes up when I lift the phone. And that’s exactly how I like it! Gestures: OnePlus has integrated numerous operating gestures into the system that are really practical. When the smartphone is locked, you can press and hold the fingerprint sensor for a long time to take a picture. You can also take a screenshot by holding three fingers over the display. There’s also many more and the good thing about it is: whatever I don’t need, I can switch off. 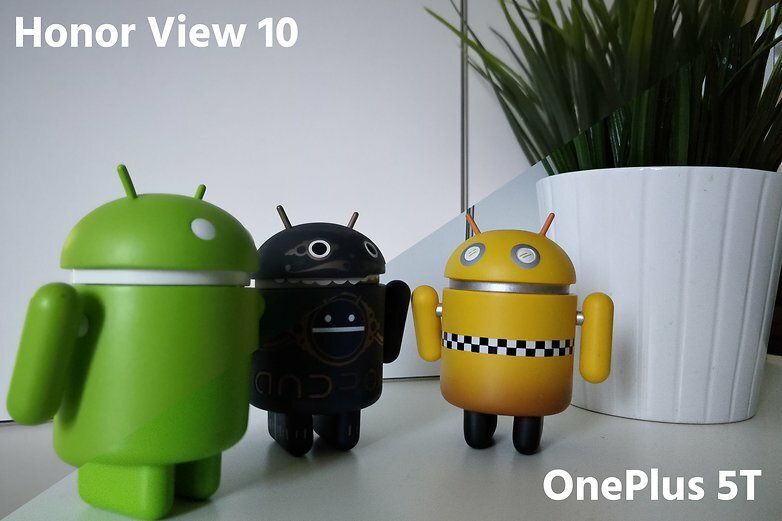 There is a considerable difference between the View 10 and OnePlus 5T in terms of software. Huawei offers Android 8.0 Oreo and EMUI 8, and the look is very well adapted and individually adjustable. On the View 10, software optimizations are still needed to improve performance, but many users won’t even notice that. The bloatware also needs to be reduced. In this article you can get a better picture of the latest version of EMUI. Honor has also thought of the gamers by integrating the Game Suite, which allows you to block alerts during game sessions so you won’t be distracted while you’re gaming. With its Oxygen OS, OnePlus has its own Android-based system on board. Unfortunately, the manufacturer hasn’t yet been able to release the Oreo update for the current flagship. Project Treble doesn’t support OnePlus. These two points bother me quite a bit, even if they’re not immediately noticeable in everyday use. There’s one other thing that I don’t like about the software at all, and that’s the underlying spying tools for which OnePlus is rightly criticized. This has led to uncertainty about my privacy, and I had hoped that the brand would have finally gotten rid of them. What I like, however, is the modern look and the fact that OnePlus has no third-party bloatware. Everything seems very tidy and clear, and even better, Oxygen OS runs really quickly and doesn’t unnecessarily slow down the fast processor. Both the OnePlus 5T and the Honor View 10 are equipped with a dual camera on the back. Both main cameras have a 16 MP sensor. The secondary cameras each deliver 20 MP, but with one difference: the Honor View 10 uses a black and white sensor to improve resolution and digital zoom, while the OnePlus 5T’s 20 MP sensor is meant to be optimized for low-light scenarios. Let’s start with the basics: in good lighting conditions, both smartphones shoot quite decent photographs, although they are different. The OnePlus 5T has a significantly stronger microcontrast and emphasizes the black parts of the image much more strongly than the Honor View 10. This would give the 5T the advantage in terms of reproducing detail. Especially in high-contrast scenarios, the OnePlus processes image contrast aggressively and gives the photos a very dramatic look that may not please everyone. 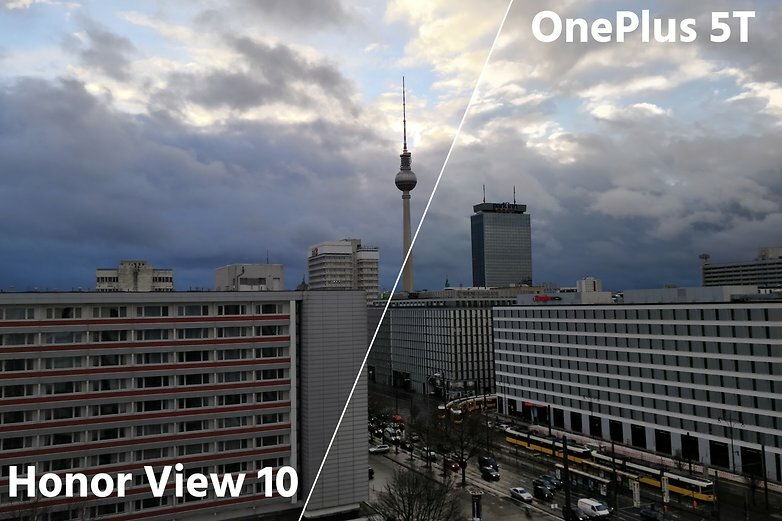 The Honor View 10, on the other hand, generally provides brighter images that in direct comparison appear almost low-contrast, but are usually more visually appealing. Especially in scenarios with large differences in brightness, the chances of getting a well lit subject are better with the Honor device. 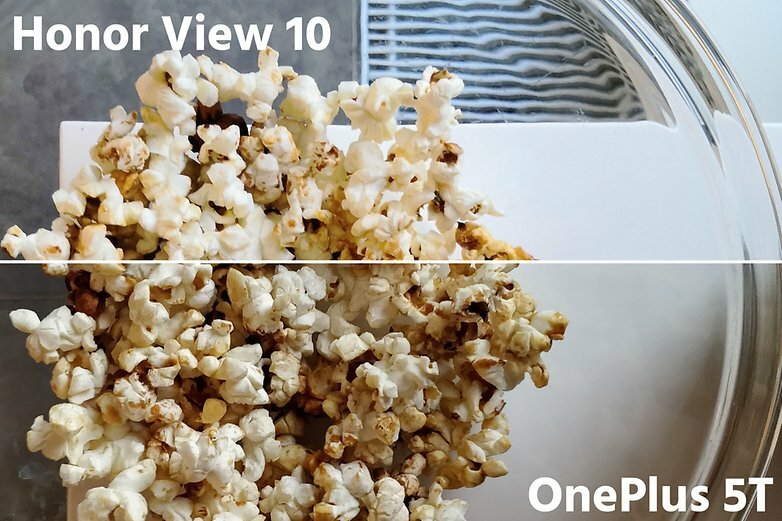 In bad lighting conditions, the Honor View 10 shows significantly less image noise. This may sound nice, but it comes at a price: noise reduction also kills details and colors and gives the pictures a rather muddy look. While the OnePlus 5T shows visible image noise in bad light conditions, the detail and color reproduction remain sufficiently stable even at ISO 2000. In daily use, View 10 performs its tasks and runs smoothly. 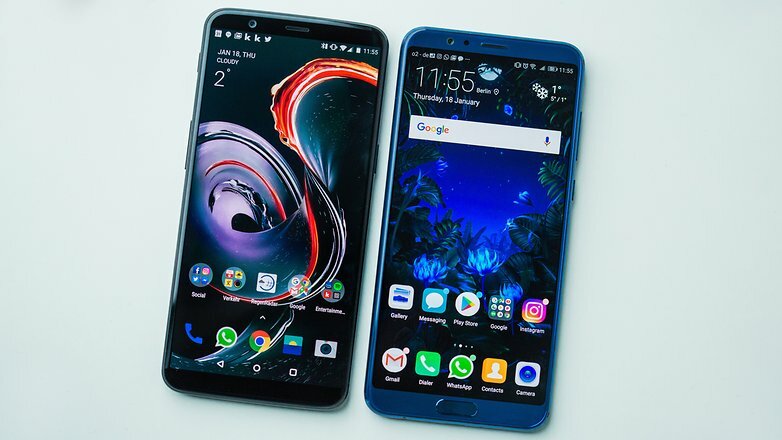 If you’re used to faster high-end smartphones, you’ll notice lower performance, but you won’t have any problems with demanding games, multitasking and playing videos and music. The View 10 is equipped with a mono speaker that also works well without distorting the sound when it is set to high volume. The 3000 mAh battery can last for one and a half days in moderate use. And if you’re using your smartphone quite intensively, you’ll usually have 20 percent of the battery left in the evening. You may need some time to get used to the fingerprint reader on the front, but as always, the Huawei sensor works quickly and accurately and can be used to unlock and navigate the system. Unlike Honor, OnePlus has moved the fingerprint sensor to the back. I like it better, especially with larger smartphones. And even more practical, if you swipe from top to bottom over the sensor it displays the notifications. But I prefer the OnePlus 5T’s face recognition, which works extremely well and also quickly. The one disadvantage is that you can’t view any notifications or controls on the lock screen, for example for music playback. The display, speed and camera do not cause any problems in everyday life and the battery lasts as long as the View 10’s. I can never go two days without charging it, but I can last a little longer than one day. What annoys me is the slippery backside of the black OnePlus 5T—it needs a cover. It’s a good thing that OnePlus includes one free of charge and has others on offer for a low price. The white 5T is not that slippery due to the sandstone surface, but it does get dirty faster. The Honor View 10 might be a bit easier to maintain. 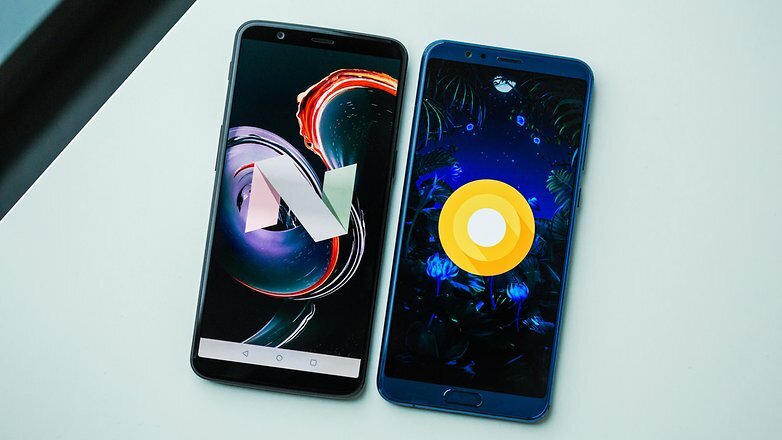 We agree: both smartphones are really good and offer a lot for much less money than the flagships of other manufacturers. There are nevertheless differences. 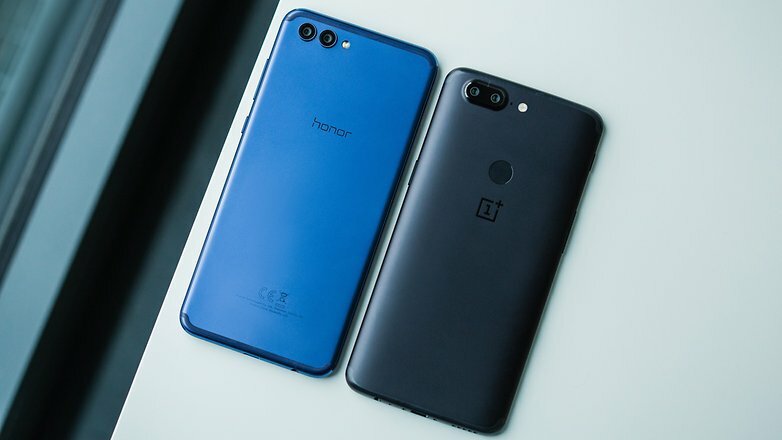 While the OnePlus 5T and the Honor View 10 perform quite similarly with respect to the battery and camera, the OnePlus smartphone has advantages in terms of design and performance, as the face recognition works extremely fast and is a really convenient feature. The View 10, on the other hand, has the more up to date software and the fingerprint sensor on the front, which many users prefer. But ultimately, the choice is yours and you can’t do much wrong with either smartphone. Choose “OnePlus 5T” or “Honor View 10”.